Luke 13:10-17 gives an account, unique to Luke, of Jesus’ healing of a crippled woman on a Sabbath-day in the synagogue where He had been teaching. The unnamed ruler of the synagogue takes the lead in opposition to Jesus’ violation of the Sabbath traditions, as we might well expect a synagogue officer to do. Once again, the rulers of a particular synagogue appear to be plural in number, and here are presented as having power to determine who may address the assembled congregation. A word related to archon and archisunagogos, namely arche, is used once in a context in connection with the synagogue. Jesus gave advance instructions to His disciples concerning their conduct when faced with persecution: “And whenever you are brought before the synagogues and the rulers and the authorities, do not worry about how or what you will respond or say” (Luke 12:11; emphasis added). The word arche is here used in an abstract sense of “rulership,” but of course indirectly refers to those who held this power. Luke’s narrative of Paul’s work in Corinth specifically mentions two individuals as archisunagogos. The first, Crispus, “believed in the Lord, along with his whole house,” and apparently left the synagogue when Paul moved next door to the house of Titius Justus, a pious Gentile (Acts 18:8). Later, after Gallio’s dismissal of the Jews’ lawsuit against Paul, some of the Corinthian populace (perhaps Jew-hating Gentiles), seized Sosthenes, the archisunagogos and apparently a leader of the Jews who brought suit, and beat him there at the court (Acts 18:17). It is possible that Sosthenes was chosen to succeed Crispus as archisunagogos after Crispus’ “defection” to the Christians, or they could have both served in this office simultaneously if this synagogue had a plurality of rulers, as did the one in Pisidian Antioch. If this characterization is correct, then the NT knows of only two synagogal offices: ruler (archon) or elder (presbuteros), and attendant (huperetes). The word translated “elder” (presbuteros) is commonly used in the NT as the designation of leaders among the Jews, but almost always referring to national rather than synagogue officials, especially in connection with the high priests and scribes (Matthew 15:2, 16:21, 21:23, 26:3, etc.). Only once is it employed in the NT to describe individuals in connection with a synagogue. From Luke’s account of the Roman Centurion whose servant was sick (7:1ff), we learn that it was the “elders of the Jews” (presbuterous ton Ioudaion) who were sent by the Centurion to implore Jesus to heal his servant. 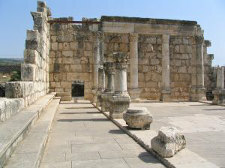 The basis of their plea is stated in verse five: “For he loves our nation and he himself built the synagogue for us,” the very synagogue building in Capernaum where Jesus preached and healed many times. The close proximity of “elders” and “our synagogue” suggests that they were in fact elders of the synagogue, though nothing is said of their duties and responsibilities. Again, they are described as plural in number. When Jesus read from the scroll of Isaiah in the synagogue at Nazareth, it was handed to Him by the attendant (Greek, huperetes; Hebrew equivalent, chazzan; Luke 4:20).2 Though the word occurs with some frequency in the NT (chiefly with reference to underlings of the temple high priests and the Pharisees, John 7:32, 45; etc. ), only once is it used of a synagogue officer. The fact that the process of passing the scroll to high priest began with the minister/attendant strongly implies that the scrolls were under his immediate and direct care. Jastrow defines the Hebrew word chazzan, “(in the synagogue) superintendent at prayer-meetings, giving the signals for responses, assigning seats, &c., sexton.” He references the two passages from the Mishnah noted above, as well as Succoth 51b in the Babylonian Talmud. Frankly, the passages cited do not seem to support the description given by Jastrow.4 What Jastrow describes may also reflect developments substantially later than NT times. While the term huperetes is not used as a descriptive term for any officer in the church, it is used of Christian preachers in its general sense of servant (see 1 Corinthians 4:1). Those who transmitted orally the message of Christ are described by Luke (Luke 1:2) as huperetai…tou logou, “servants of the word,” which in a very literal sense is how the huperetes functioned in the synagogue: he was the guardian or trustee of the Word of God. Paul, after describing himself and Apollos as huperetas Christou, “servants of Christ,” adds kai oikonomous tou musterion theou, “and trustees of the mysteries of God” (1 Corinthians 4:1), which again could literally be applied to the attendant’s role in the synagogue. In the post-NT era, the various offices in the synagogue multiplied (as did the offices in the Christian churches) and a more formal hierarchy developed. Passages from rabbinic literature which were quoted above, especially from the Mishnah, give some sense of this development. However, since these are post-NT developments, they cannot serve to illuminate the relationship of first century synagogues and churches and need not be examined here. The second office in the NT churches is that of deacon, the name of which is merely a transliterated form of the Greek word diakonos, and which, like huperetes, means “servant.” This office was instituted to meet a very practical need in Acts 6:1-6 (though technically, the seven men chosen there are not called “deacons”), and the requirements for those who would fill this responsibility are recorded in 1 Timothy 3:8-13. Outside these passages, the office is little-noted in the NT (elsewhere only Philippians 1:1 and Romans 16:1). 1 Alfred Edersheim, The Life and Times of Jesus the Messiah, vol. I, p. 438. He does cite some rabbinic and modern literature in support of his analysis. 2 The Greek word huperetes occurs with some frequency in the New Testament, but only in Luke 4:20 with reference to an officer in the synagogue. Most of the references are to the assistants/servants of the Sanhedrin (Matthew 26:58; Mark 14:54, 65; John 7:32, 45, 46; 18:18; Acts 5:22, 26) or other government officials (Matthew 5:25). See Abbott-Smith, A Manual Greek Lexicon of the New Testament, pp. 459-460. 3 Danby, The Mishnah, p. 170. Emphasis added. This is repeated in Sotah 7:7, 8 with the series advancing one step beyond the high priest in the latter paragraph to the king; ibid., p. 301. 4 Marcus Jastrow, A Dictionary of the Targumim, the Talmud Babli and Yerushalmi, and the Midrashic Literature, p. 444. 5 Rather than examine in detail the precise nature of the office of pastor, the author directs the reader to standard treatments: John Gill, Body of Divinity, pp. 862-876; John L. Dagg, Manual of Theology: A Treatise on Church Order, pp. 241-266; A. H. Strong, Systematic Theology, pp. 914-917; A. T. Robertson, Jesus as a Soul Winner, pp. 22-34. That “elder” and “overseer” were designations for one and the same office is shown with great persuasiveness by J. B. Lightfoot, Saint Paul’s Epistle to the Philippians, pp. 95-99. 6 Again, rather than discuss the office in detail, the author directs the reader to standard treatments: John Gill, Body of Divinity, pp. 881-886; John L. Dagg, Manual of Theology: A Treatise on Church Order, pp. 266-267; A. H. Strong, Systematic Theology, pp. 917-918. Thank you for a very helpful article. Indeed, an excellent series. Thanks. Great article and timely for me. We have been working on moving from Pastor-Deacons to Elders-Deacons for a few years. Here's another source discussing the relationship between OT leadership and NT.